Shortbread cookies are a welcome treat any time of the year, but they are the quintessential Christmas cookie. 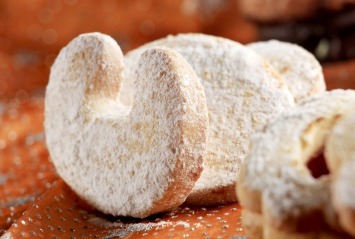 What is the holiday season without those buttery sweet cookies, plain or decorated with sprinkles, gumdrops or icing? This is an easy and delicious shortbread cookie recipe, with many variations (see below). Combine the flour, cornstarch, icing sugar and nuts in a large bowl. (Ideally sift them together). Blend in the butter with a large spoon. Work with your hands until a soft, smooth dough forms. Shape into 1 inch balls. Place on an ungreased baking sheet about 1 1/2 inches apart. Flatten the balls with a lightly floured fork. Shape the dough into a smooth roll about 1 1/2 inches in diameter. Wrap and chill until firm (about 4 hours or overnight). The rolls can be stored in the refrigerator for up to 1 month. Cut the roll with a sharp knife into thin slices. Place on an ungreased baking sheet. Bake at 300ºF for 20-25 minutes or until the edges of the cookies are lightly browned. Remove from the sheet and cool completely before storing. Dust with icing sugar or ice with frosting. Makes about 36 cookies, depending on size. Instead of slicing the cookies into thin slices you can also roll the dough into a large thin sheet and use cookie cutters shapes of your choice to cut the dough into festive shapes. Bake as directed then decorate. This recipe is perfect for stacked, jam filled cookies too. Cherry Pecan Shortbread – Omit the hazelnuts. Mix the dough until smooth then mix in 3/4 cup chopped candied cherries and 1/2 cup chopped pecans until evenly distributed. For an attractive presentation, double the recipe. Use red cherries in half and green in the other. Hazelnut Shortbread Cookie Recipe – Add 3/4 cup finely chopped hazelnuts to the dough. Chocolate Shortbread Cookies – Increase the icing sugar to 2/3 cup. Add 3 tablespoons of cocoa with the dry ingredients. Coconut Shortbreads – Add 1/3 cup finely shredded coconut to the dough and blend well. Fruit Shortbread Cookies – Add 1/2 cup of finely chopped candied peel with the dry ingredients. Raisin Spice Shortbreads – Add 1/2 teaspoon ginger and 1/4 teaspoon each of nutmeg, cinnamon and allspice to the sifted dry ingredients. Add 1/2 cup chopped raisins to the dough and blend well. Try making a double batch of the dough then dividing it and making a variety of wonderful Christmas cookies. Your holiday dessert plate will look beautiful with the wide variety of cookies you can make from this recipe. These cookies are perfect for cutting into shapes with festive cookie cutters, or use this recipe any time of year and use cookie cutters to mark the season or occasion. However you make them, everyone will certainly enjoy them. Shortbread cookies are the perfect holiday cookie. For more Christmas cookie ideas look here.